UBass Lesson | 7 ”Satellit” (Part 1) – Play UBass! Ok now it’s time for part one of my lesson on the song ”Satellit” by Ted and Kenneth Gardestad. (For a short live clip of this song go to this blog post). In part 1 we will focus of the music theory side of the song. We will look into triplet/shuffle playing and use the classic Swedish pop song as our ”tool”. There are other songs in this shuffle or 12/8 style that you might be more familiar with. One of the most famous might be ”Hold the line” (by Toto). We will also check out what scales (modes) the different riffs derive from. In the sheet music I use triplets to write down the bass part. (See video – coming soon in Part 2 of this lesson). You can think of an 8th note triplet as three 8th notes evenly spaced where you normally would play just two. One way of describing this could be with the use of the 12/8 time signature. When I describe shuffle rhythm I often use the 12/8 example and the take away the middle 8th note of every group of three 8th’s. For more on shuffle rhythms and a way of playing those see this video. Either way you should divide the pulse into four beats. In 4/4 it will be four quarter notes and in 12/8 it will be four dotted quarter notes. Since ”Satellit” is mainly based on triplets (or groups of three 8th notes) I choose to write it in 4/4. Jazz notation: In the case of swing music notation you often use regular 8th notes and write at the top of the score or lead sheet that the 8th notes should be played with swing/shuffle rhythm feeling. That way you don’t have to write out every triplet. Besides the 8th note triplets there are also a couple of quarter note triplets. The same method is used here. You ”squeeze” three quarter notes in the space of two. These triplets are a bit harder to do. But if you play along with the video (in part 2) and maybe the original recording or why not other songs using these triplets I think it can help you get good at this quickly! For more on triplets please check out John Goldsbys column in Bass Player! There are two main riffs in ‘Satellit”. The whole song starts with Riff 1. In the chorus it’s time for Riff 2. Riff 1 is also played during the guitar solo and outro. Okey. What are the scales/modes used in these riffs? Riff 1 is clearly based on the G minor pentatonic scale. This scale uses five notes from the G minor scale. G minor pentatonic: G-B flat-C-D-F-G.
Riff 1 starts on scale degree 1 moves down to scale degree 7 and then climbes up the scale. Let’s devide the riff into three phrases. I think this is a nice way to really make the most of this scale. Making up little motifs based on small parts of the scale and the make connections between these motifs using nothing more than notes from the scale! Riff 2 is really based only on the Bb major scale! And this works really well because the the key of the tune is B flat major. Let’s break it down a little bit. Bb major – D minor 7 – Eb major – F11. (F11 is a E flat major triad with F as bass note). As you can see all of these chords derive from the B flat major scale and chords based on that scale. This means the B flat major scale will work throughout the chorus! On the first chord (B flat major) the riff starts on the 3rd degree (Bb: 3-2-1) and then moves to next chord using the same three notes landing on the D. After this we have a long scalar motion starting on the Eb (the 4th degee of the Bb major scale) moving all the way to the high Bb. Now we know that Riff 1 is based on G minor pentatonic and the chorus riff is based on the Bb major scale. How come this works? Well it’s because these to keys are related [G minor is the relative minor to Bb major] and use the same notes with different starting points/notes! Check out this picture of the circle of fifth. As you can see B flat major and G minor both have flatted B and E! Watch the original version with Ted Gärdestad from the Melodifestivalen 1979 (Swedish TV) on YouTube. Stay tuned for part 2 for a video lesson on how you can play the bass part! This is fantastic. Some of the theory part (scale/modes) goes way over my head, but that’s what so great. I have read this post twice now in different days, and each time I understand a little more based on my previous knowledge and what I read the last time, and it makes me want to learn even more. I am thrilled! Thank you basmagnus! I’m looking forward to part two. I’m glad you like it! Please let me know if you want me to try to explain any part of the lesson in another/new way! I might be able to clarify something for you! Part 2 will be posted soon! That would be awesome of course! I’m just not very sure what scale degrees are, and what for instance this means: 1 – b7 – 1 – b3 – 4 – 5. If they are the tones of the scale (G minor pentatonic in this case, right? ), what does the b stand for? I feel as I might sort of understand if, I would just have to sit down and look at it for a while to get the feel of it, you know? Knowing it could do wonders for improvisation I’m sure. And, when you write for instance ”F11 is a E flat major triad with F as bass note”, is there somewhere where you could look up things like this, or does it have to be learned by heart? Ok. Here’s more info on the lesson! There are a lot of them! But let’s focus on the most common ones and the ones used in ‘Satellit’. 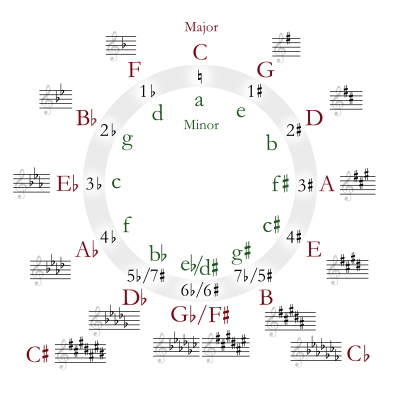 There are major and minor scales (7 notes each) and then then there are pentatonic scales that uses five notes from either the major of minor scales. ‘Satellit’ has the key signature B flat major (Bb)BUT starts on G minor (Gm or G-). These keys are relative keys. In Major keys the 7th degree is alway a major 7! (In Bb it’s the A) and the 3rd degree is always a major 3rd! In this scale (Natural minor) the 7th degree is always a minor 7 and the 3rd degree always a minor 3rd! In this song the ‘Intro’/’Solo’/’Outro’ and ‘Verse’ is G minor while the chorus is B flat major. This works really well since the keys share the same notes! The b stands for minor 7 (see my explanation of the G minor scale above). The chord is based on the F dominant scale. (It’s a major scale with a minor 7). As you see numbers 1 and 8, 2 and 9…are the same. That’s why the F11 is called F11. You can also call it a sus chord or suspension chord. This is used to make the chord less ”obvious” and more interesting then ‘just’ a regular major chord! I hope this makes it a bit clearer…or is it even more confusing after this? Magnus, this is gold, thank you! I slowly am starting to understand. You have a very pedagogical way of explaining things! Thanks John! Glad I can help! Part 2 almost done now! Pingback: UBass Lesson | 7 ”Satellit” (Part 2) « Play UBass! Pingback: [Style Study - UBass Lesson 8] Jazz: Walking Bass | Part 1 « Play UBass! Pingback: Kala ubass on Swedish tour and Live CD | Play UBass!